There’s always something in Sanderson’s story that resonates with me. Whether it’s a topic involving religion, oppression, camaraderie, or love, any book he writes will always feature one theme that is expressed articulately, and that is hope. In my opinion, out of every book that Sanderson has written so far, Oathbringer is the darkest in terms of tone. Yet, despite how dark the story gets, Sanderson reminds us that hope will always be there, and it is a theme that I will always appreciate. It’s refreshing, satisfying, and makes me happy to read his books. There’s always something philosophical and positive to learn and apply in our real-life situations from Sanderson’s books, and that remained true here, maybe even stronger than ever. The story was unpredictable, full of twists and turns and filled with tons of revelations. Oathbringer managed to build upon every foundation that was prepared since the beginning of The Way of Kings, and in phenomenal ways. In this gigantic book, there are no words wasted. In fact, there is so much plot progression in Oathbringer that it makes both The Way of Kings and Words of Radiance–as epic and majestic as they are already—feel like a preparation for this book alone. With new antagonists who completely raise the stakes for Roshar, along with tons of powerful and memorable moments, Oathbringer is a meticulously structured book that felt like a trilogy or duology on its own. The amount of action sequences in this book far surpasses both of its predecessors. Sanderson is seriously at the top of his game when it comes to his action scenes here. If you have read any of Sanderson’s books, you should know by now that Sanderson always prepares a fantastic climax sequence to end his book in a memorable way; this applies for all of his books. The fanbase called it the “Sanderson Avalanche” (no idea who named this in the first place) and this time, we didn’t get just one, but two avalanches. This, in my opinion, is a very smart move. Not only it made the book felt like a duology/trilogy, it also made the pacing exceptional. Unlike Words of Radiance, which featured Sanderson’s best close-quarter combat sequences to date, Oathbringer’s final conclusion is more of an epic war on a grand scale. Giant monsters, magical blades, magic clashing and unleashed, dark and cataclysmic situations, heart-pounding, intense, fist pumping and poignant moments, all told in magnificent shifting multi-POV narration; it was action-packed, pivotal, and simply epic in the true sense of the word. It’s been half a year since I’ve read and reviewed any of Sanderson’s full novels. 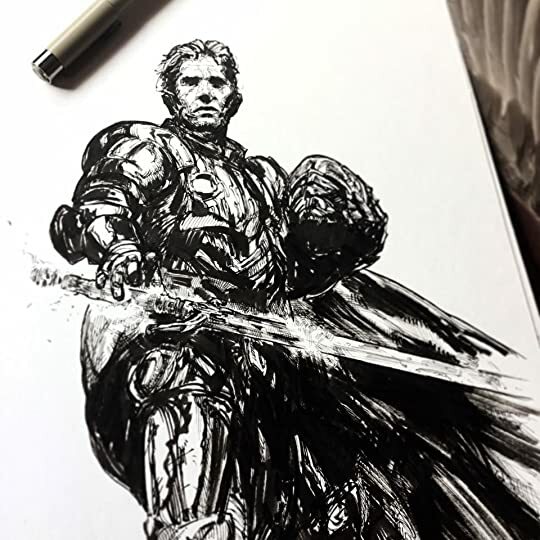 You know what made me miss his work the most? His characterizations. Sanderson always has a way of developing his characters with his narration to the point where we truly get inside their heads, even when it’s written in third person perspective. I’ve read a lot of fantasy books and there are really only a few authors who can do this wonderfully. The number of characters featured is not small by any means; this series features hundreds of characters. At the same time, it features Sanderson’s biggest cast of POV; yet these characters all remain distinct and unique in their personalities. Tons of characters—both main and side characters—receive proper and significant character developments, but the spotlight of this book undisputedly goes to Dalinar. We have seen Kaladin’s past in The Way of Kings, Shallan’s in Words of Radiance, and finally, it’s time for Dalinar’s. If you have started the first book, most likely you’ll know already what Dalinar past will involves. I need to remind you of this: unlike the previous two books—even though Words of Radiance was meant to be Shallan’s book—Kaladin is not the main character here. Oathbringer is without a doubt, Dalinar’s book. It’s truly an incredible experience to have witnessed Dalinar’s growth throughout the passage of time. Three chapters into his past and I can say that it was already better than all Shallan’s flashback chapters in Words of Radiance. I was completely captivated by Dalinar’s character development and history here; Sanderson truly did a superlative job in integrating Dalinar’s past into the main storyline. It was emotionally rewarding to read the culmination of all his experience in this book; making him one of my favorite characters of all time. If I have to choose only ONE thing that Oathbringer did better than its predecessors, it’s definitely the lore and world-building. The world-building is already masterfully done in the previous two books, but somehow, Sanderson successfully made it even better. The Way of Kings and Words of Radiance storylines were heavily centered on The Shattered Plain, whereas Oathbringer finally diverts its attention from that place and visits many other major cities in Roshar. It’s epic in scope and, combined with intricate maps and astounding revelations in the lore, this is once again Sanderson at the top of this game. If you’re not a fan of intricate world-building, I seriously think you’re going to have a hard time enjoying this series because that is definitely one of the main strengths of this series. I’ve talked about Sanderson’s prose several times now, and I don’t think I need to state how well written his books are. His prose is simple, immersive, vivid, (Oops, I did it again) but the most important thing to me is that it always feels like coming “home”. Sanderson shows us that fancy words and purple prose aren’t necessary to create a masterpiece of an epic fantasy. His writing never felt forced, it’s like all these words came to his head naturally. A sign of an amazing book is when you’re reading and never felt bored with any page. Oathbringer is in fact the biggest single installment I’ve ever read in my life, and I was completely enthralled with every moment of it. Some much smaller book could make me feel like homework but for Oathbringer, despite its staggering size, I still craved more. This is all due to the extremely well written and well-polished prose style that Sanderson employs. Let’s talk about the book’s value. When people told me they don’t want to start this series because it’s too monstrous, I honestly can’t agree with that. The Way of Kings and Words of Radiance were too short for me; with each book’s conclusion I always ended up craving more, and that’s still true here. Oathbringer is a staggering 450k words or 1243 pages and somehow, it’s still not enough. Plus, each book in the series feels like a special limited edition. Starting from the beautiful endpapers by Dan Dos Santos and Howard Lyon, then the gorgeous chapter icons and twenty-two interior artworks by amazing artists such as Miranda Meeks, Kelly Harris, Ben McSweeney, Isaac Steward and once again, Dan Dos Santos, we are given so much in order to enrich our imagination and experience. Oathbringer is truly a MUST HAVE book. At the time of writing this review, I have around one hundred physical books and only three of them—Words of Radiance, Oathbringer, and Arcanum Unbounded—are hardcovers. I won’t go into full detail on why I dislike hardcover, but to explain it as simply as possible, they’re heavy, uncomfortable to read, and super expensive. However, I have to make a special exception for this series because of its gorgeous artworks and satisfying value. I spent $45 to buy the HC of Oathbringer, (it is that expensive where I live) but it was truly money well spent and I’ll do it again for future installments of the series. Picture: Thaylen Female Fashion by Dan Dos Santos. -Is it better than the previous books? Sadly, I have to say no. It’s definitely better than The Way of Kings but not Words of Radiance. In my opinion, it’s inferior to Words of Radiance in terms of quality. There are some things that Words of Radiance did better, especially when it comes to intimate and evocative scenes, and there are also some ways in which Oathbringer surpasses it, such as plot and world building. However, this will be the first time I actually have some cons—though they are minor—with any installment in this series. To me, the main character of the series is Kaladin. This is almost completely a Dalinar and somehow, Shallan’s book. I know, I know, it was meant to be written that way, and I have no complaint about how it’s written. 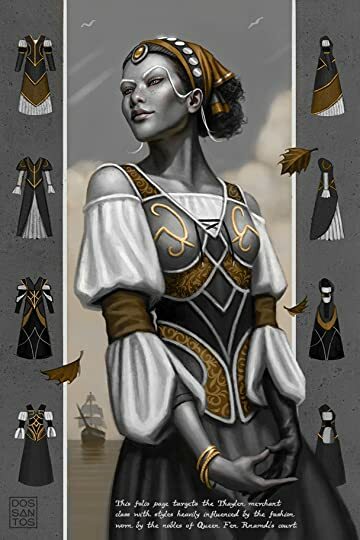 However, Kaladin’s storyline didn’t truly begin until halfway through the book, which took 600 pages; before that, his POV was scarce and close to nonexistent despite him making an appearance in other character’s POV. It’s just a matter of preference; Dalinar’s, Shallan’s, and everyone’s storyline are incredibly compelling in their own way, but Kaladin and Bridge Four will always be special and remained one of the most illuminating parts of the series for me. Secondly, I mentioned in my Words of Radiance review that I fell in love with Shallan’s character there, but Oathbringer changed my mind on this. Shallan’s growth—though fascinating and making the plot more interesting—occurred in ways that made me dislike her character. Shallan is, in fact, the first female character written by Sanderson that I dislike at this point, and I sometimes even found her infuriating. Lastly, there are two scenes that I wish didn’t happen off-screen. Do know that these are minor cons and that the three books in The Stormlight Archive totally stand above almost all books I’ve ever read in the genre. Oathbringer is not a perfect book by any means, but just like true love, I absolutely love this book with all my heart despite some flaws it had. Diving into this series is like diving into a long-term relationship, and one I’m glad to partake in. 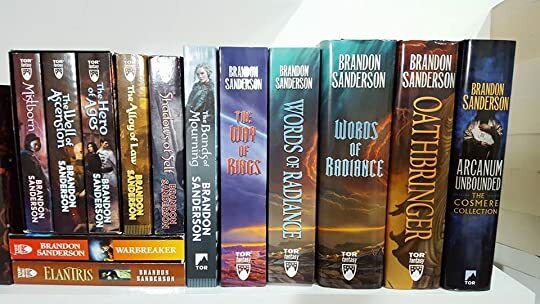 Call me selfish but right now, I’m at the point where I’ll be completely happy if Sanderson decides to drop all his outside of Cosmere universe works. I just can’t bring myself to care about his other books outside of Cosmere when in fact, I already know that the Cosmere and this series comprise his magnum opus. The Stormlight Archive has always been one of the series which I urge anyone to start as soon as possible, and this is still true. Waiting for the completion of this series before diving into it is ridiculous; not only are you going to have to wait at least twenty years before its completion, but we don’t even know what the future holds for this series, and for each one of us. Do. Not. Wait. Start this masterpiece series now and let us speak the ancient oaths together! Side note: I need to remind you once again to please read Warbreaker before diving into this series; same as Words of Radiance, one more character from that book appears here. I am so jealous because I have book 1 for almost 3 years now and need to read it next year for sure! I think I will given that the Mistborn trilogy was one of the best things I read this year!